Filed to: Can You Help Me Transfer Funds?Filed to: Can You Help Me Transfer Funds? Can You Help Me Transfer Funds? “Mike” (portrayed above) is a real person and his email party is now over. Authorities announced today that a 40-year-old Nigerian man, identified only as Mike, was nabbed in a joint operation by Interpol and the Nigerian Economic and Financial Crime Commission. Mike was reportedly the mastermind behind a large number of online scams, and officials suspect him of swindling more than $60 million from people around the world, including $15.4 million from one victim alone. He reportedly led a web of at least 40 people in Nigeria, Malaysia, and South Africa, and had “money laundering contacts” in China, Europe and the United States. Mike allegedly favored payment diversion fraud, a famliar con in which “a supplier’s email would be compromised and fake messages would then be sent to the buyer with instructions for payment to a bank account under the criminal’s control.” Authorities say that Mike also committed CEO fraud, which involves sending fraudulent emails from an executive’s account and asking for a wire transfer. He even engaged in something called “romance scams,” so if you’ve recently fallen in love with someone who wooed you over email, now might be a good time to check your bank account. Mike now is up on charges of hacking, conspiracy, and obtaining money under false pretenses. Alas, Interpol didn’t tie Mike to my favorite kind of Nigerian email scam: the “wire me funds and I will give you a cut” kind, which I almost once responded to as a nine-year-old before my father caught me and taught me about cybercrime. 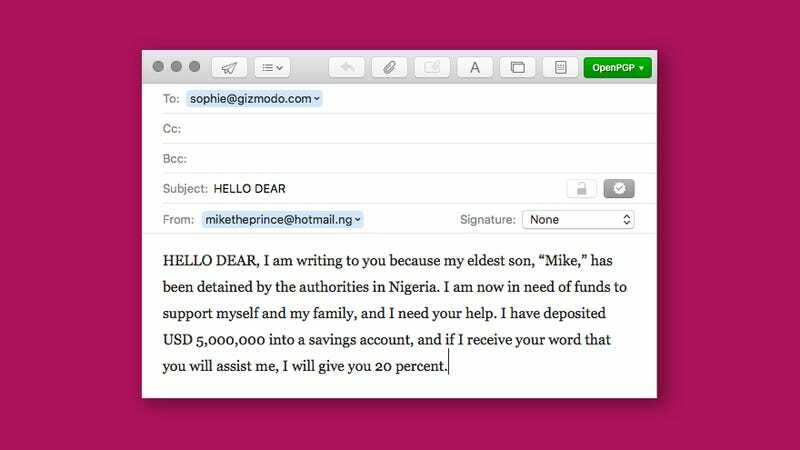 Still, Mike—and countless other scammers—are proof that the Nigerian email scam will thrive as long as gullible people exist on the internet.